"Strawberries and bananas are blended with yogurt and milk in this easy and delicious smoothie." 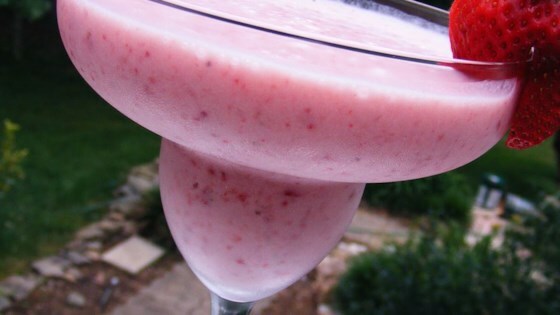 In a blender, combine bananas, frozen strawberries, yogurt and milk. Blend until smooth. Pour into glasses and serve. excellent, the entire family loves this smoothie. Sometimes I use 1/2 cup frozen blueberries and 1/2 cup frozen strawberries, this is also very good. I made this the night before so I could drink it for breakfast. WOW! It was delicious. I will make this often a great pick me up! I reccomend this for anyone who wants a quick snack. Amazing. I love strawberries and banana smoothies. The only change I made was using plain yogurt and some splenda to sweeten as opposed to vanilla yogurt. Delicious! This is better with only 1 banana, fresh strawberries, vanilla soy milk, and some crushed ice. Makes a great quick breakfast! This was really good, i added a little splenda, a shot of fruit juice and a handful of ice. I froze both the banana and the strawberries and sweetened it a little with sugar. Also added vanilla flavored soy powder. Yummy! My strawberries were fresh, so we added some ice to the blender. Very flexible recipe. Can't wait to try it with peaches!! Thanks Clara!